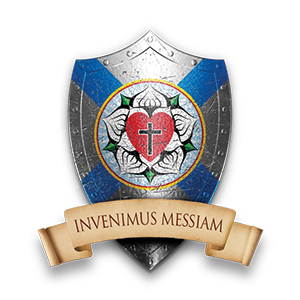 The logo of St. Andrew’s Lutheran Church in Halifax. The Latin means “We have found the Messiah” and comes from John 1:41. Thus began the supplement to the call documents for the new position of the East District’s Atlantic Canada Circuit Rider. These sentences point out the bi-directional ministry that the whole Christian Church is called to keep in focus. As the East District Board of Directors struggled to implement a different model for ministry in Atlantic Canada, keeping both directions for ministry in the picture was of primary importance. Since work began in the mid-1980s in this region, the Holy Spirit has been calling people by the Gospel gathering people into church families, and sustaining people in the one true faith in Christ through Word and Sacrament ministry. There is now one chartered congregation (Good Shepherd, Moncton, New Brunswick, served part-time by their called pastor, Rev. David Milette), an established mission (St. Andrew’s, Halifax, Nova Scotia), and exploratory missions in central Nova Scotia and Charlottetown, Prince Edward Island. As well, there are people receiving pastoral ministry in western New Brunswick and Newfoundland through live-streaming of worship services and Bible studies from the Moncton congregation and through pastoral visits when possible. Throughout its history, the congregation in Moncton has been faithfully served by its own called pastor. The church in Halifax was served for several years by a district missionary. It then became a “preaching station” under the oversight of St Peter’s, Stratford, Ontario. During this time the people there were served by LCC Canadian Forces chaplains stationed there. But their time was limited. And the people in the other areas where our Lord was gathering them together were receiving pastoral ministry only sporadically. 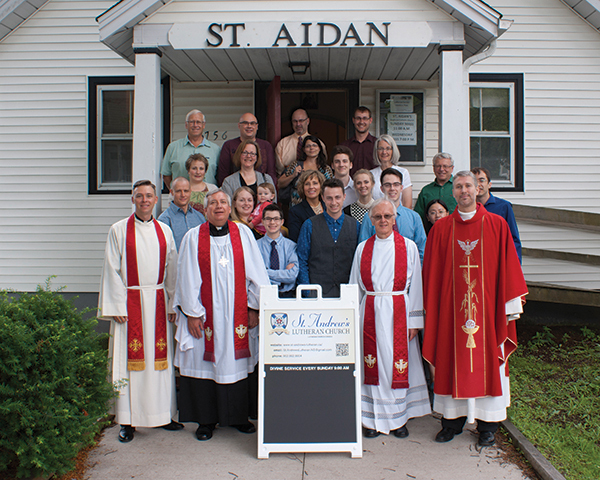 Members of St. Andrew’s gathered on July 26 for the Installation of Rev. Mark Smith as the East District’s Circuit Rider for Atlantic Canada. In front from left to right are: Chaplain David Jackson, East District President Paul Zabel, Rev. Dr. John Stephenson, and Rev. Mark Smith. With St. Peter’s words in mind that we shepherd the flocks that He gathers together, the East District Board of Directors extended a call to Rev. Mark Smith to serve in the newly created position of Atlantic Canada Circuit Rider. He accepted that call and was installed on July 26, 2015. Most of the Halifax congregation and some from the Annapolis Valley group attended this joy-filled, hope-filled worship service. East District President Paul Zabel officiated in the Rite of Installation. Chaplain David Jackson (Rev. Smith’s seminary classmate and friend stationed in Halifax) served as liturgist. Rev. Dr. John Stevenson (Rev. Smith’s friend and seminary professor) proclaimed God’s Word of forgiveness, life, and salvation to all those gathered there that day. Since his installation, Rev. Smith has gotten a feel for the distances involved in ministering to the people throughout the circuit he has been called to “ride.” He has visited with the members of St. Andrew’s and most of the people in the Annapolis Valley mission site. He has established a regular schedule for worship, visitation, and Bible study with them. He has crossed the Confederation Bridge numerous times and connected with the people attending the Charlottetown mission site, establishing a regular schedule for ministry there as well in cooperation with Rev. Milette. He also has plans to connect in person with the people in Newfoundland who up to now have mostly been pastorally cared for via the internet. With the outreach focus of his ministry in mind, Rev. Smith has also begun catechesis with several people who have visited worship services, contacted him through various means, or been referred to him by other pastors. The numbers attending worship services in P.E.I. have continued to grow as people hear about this ministry that is now happening twice each month on a regular basis. Rev. Milette has also experienced growth at Good Shepherd, catechizing and receiving new members, starting work among university students, and seeing more people worshipping with them online. Often as Rev. Smith reports about his ministry, he mentions that someone has told him about another person or family that he could contact. Sometimes these are Lutherans who have moved “out East.” Sometimes these are friends or family members who have been searching for a church home. Sending Rev. Smith contact information for people you know who could benefit from this ministry. Joining any of these groups for worship when you are visiting in the Atlantic Provinces. Coming to Him who answers prayer on behalf of the Atlantic Canada Circuit Rider Rev. Mark Smith and the various groups and individuals he has been called to serve. Rev. Ron Mohr is the East District’s Mission Encourager.